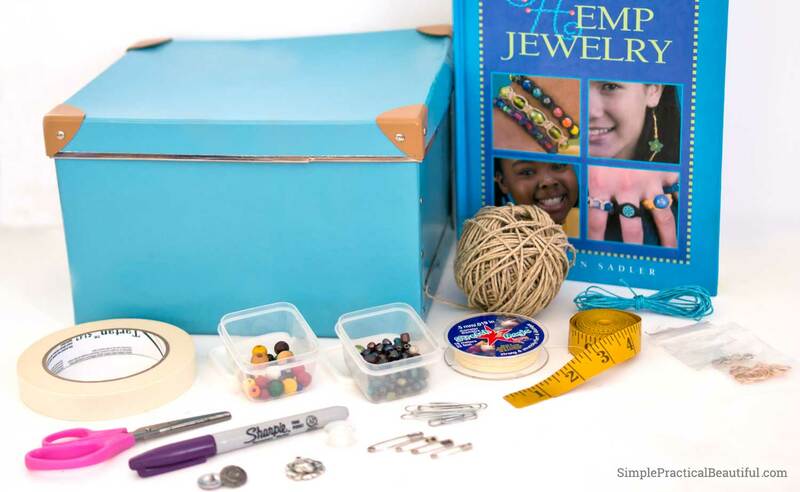 Create a jewelry-making kit to give to your favorite teen or tween this year. Include a good how-to book and lots of fun supplies. My kids have lots of stuff. Their room is full of stuff, and I feel like they are constantly getting more stuff to add to the pile. I don’t want to give them even more stuff this year for Christmas, so I’ve been trying to think of gifts I can give them to do, instead of to have. I decided to give them a kit to make jewelry. That way they can make something useful and beautiful, and maybe even give it away, and when they are done, they will just have a book left. 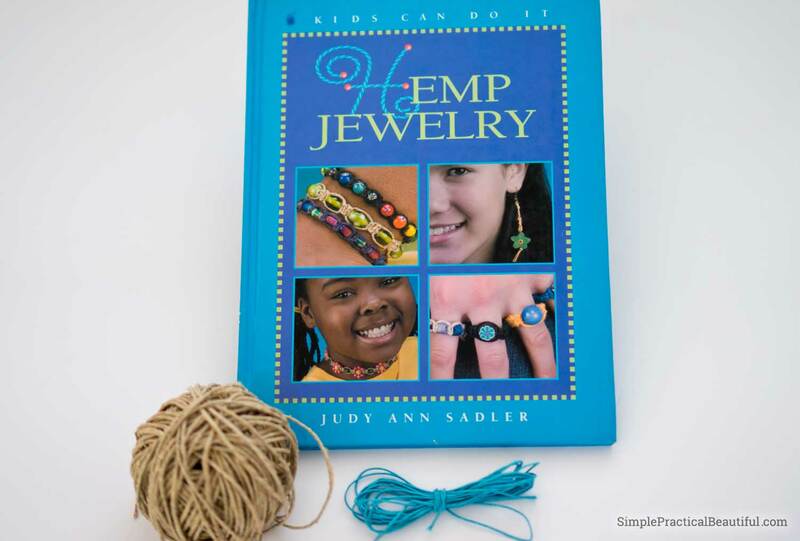 There are a lot of books that teach how to make jewelry that I could use, but I found Hemp Jewelry by Judy Ann Sadler on Amazon, and I really liked it. The words are simple and there are lots of pictures. It’s great for beginners, but also has a few more advanced projects at the end. 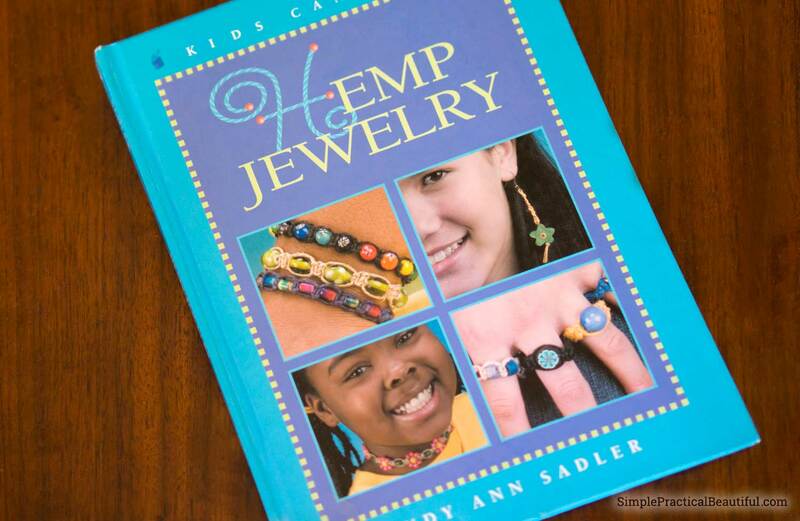 Hemp Jewelry even has a page that tells what supplies you need, or might like to have, to make jewelry. That was my shopping list. 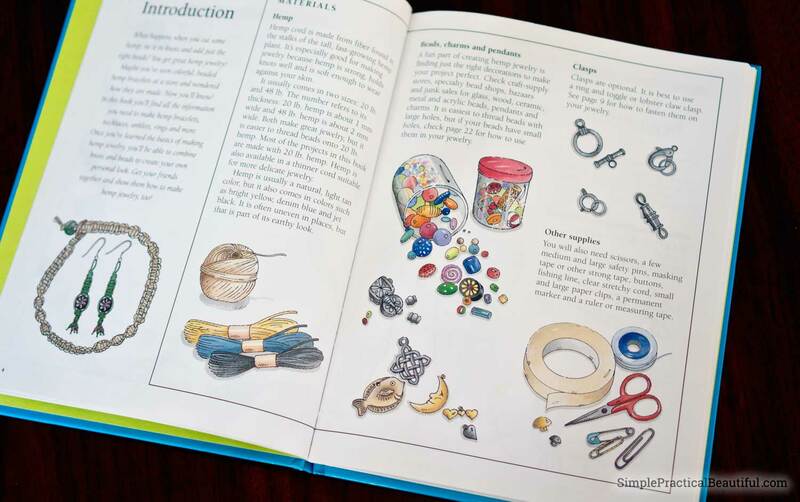 I tried to get a little of everything the book listed so that my kids would have lots of options to make jewelry. That’s all the supplies the book listed. Of course, you don’t need to include everything if you’re giving a jewelry-making kit. 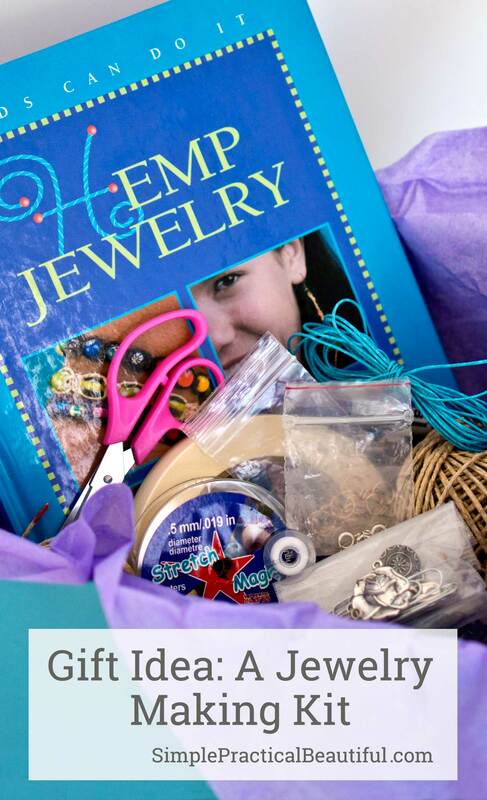 All your teen or tween really needs to start making jewelry is a book of instructions and a roll of two of hemp cord. 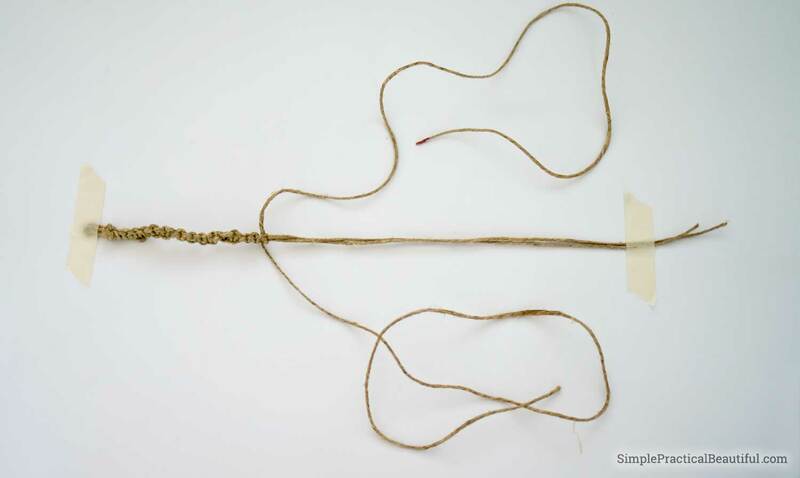 Here’s a necklace that Jane started making out of hemp cord. The book gave her good directions on how to set it up and how to make it. 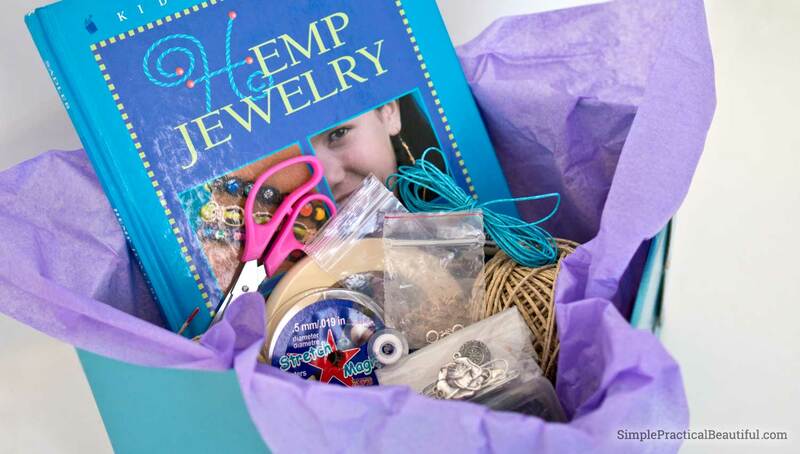 Making hemp jewelry is mostly just tying knots. Here’s a finished hemp necklace I have, so you can see an example. I’m really excited about this gift. I think my daughters are going to love making jewelry. I can’t wait to see their creativity. And best of all, this is a gift they will use up instead of just having more stuff.